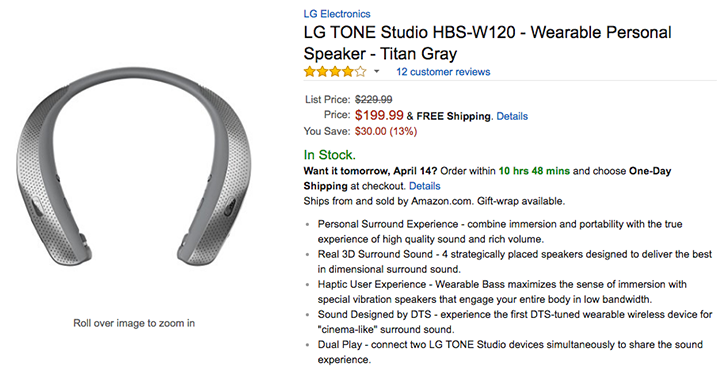 LG's new Tone Studio headphones are a little awkward. They follow the same design as the company's well-loved neckband Bluetooth earphones, but they add a speaker in case you want to envelop yourself in music without actually stuffing something into your ear. I can understand the use case for those who are constantly mobile in a certain environment, say while they move from home to car to office or while they clean different rooms of the house, and who don't want to bother with connecting and disconnecting from multiple speakers and headsets. That doesn't make the idea any less awkward though. The Tone Studios went on sale at the end of March for $229.99, but they're already down $30 to $199.99. That's just 13% off the price, though the novelty of the item makes the discount more appealing. And you can grab them at Amazon, B&H, or Verizon for that same lower price. Specs-wise, you should expect 35 hours of battery life in earphone mode and 6 hours in speaker mode, a built-in Hi-Fi DAC, 4 speakers with 2 providing haptic bass around your neck, and easy switching between 3 equalizer modes. The reviews are rather mitigated so far, with some applauding the surround speakers and some complaining of their "tinny" sound. If you'd like to give them a try for yourself, the links to them on all 3 retailers are below.